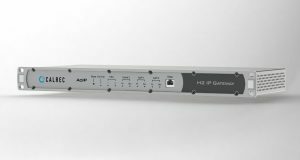 Calrec Audio will reveal two new IP products at IBC 2018 (stand 8.C61): the H2-IP Gateway and the AoIP Modular I/O controller card. Both products are SMPTE 2110/AES67-compatible and expand the range of AoIP solutions Calrec now offers. These two new solutions build on Calrec’s new Impulse core, a native-IP core for use with Apollo and Artemis surfaces. The H2-IP Gateway provides an interface between a Hydra2 network and an AoIP network. It also awards an extra control level that allows audio labels to be passed in both directions between the two networks along with control data. This gives Hydra2 users the ability to control gain of Calrec AoIP mic inputs, and AoIP users can control gain of Hydra2 mic inputs. Also being launched is a new Modular I/O Controller card that can operate in either Hydra2 or AoIP mode. The mode is selected via a simple switch on the card making it dual purpose, allowing for it to be used on either network. Not only will this make a tailorable AoIP I/O solution for the new Impulse core, it also fits into existing Modular I/O frames so units can be upgraded in the field.